The competitively priced SAMS-M1 prides itself on simplicity of use and its ruggedized build quality. Once commissioned, the system allows for rapid deployment and can be easily moved from location to location, redeploying at the touch of a button. The system's auto-acquisition technology allows the user to create a high speed stable internet connection in under a minute, with no technical experience needed. 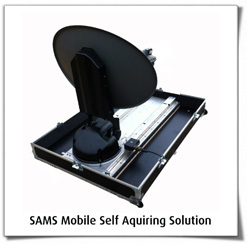 The SAMS-M1, is an Enterprise Grade Mobile Ka- band Internet/Data Solution, designed to deliver reliable instant Broadband anywhere.